We’re halfway through the Tour de France and so far the toll is a stack of crashes, torn lycra, scrapes and broken bones. 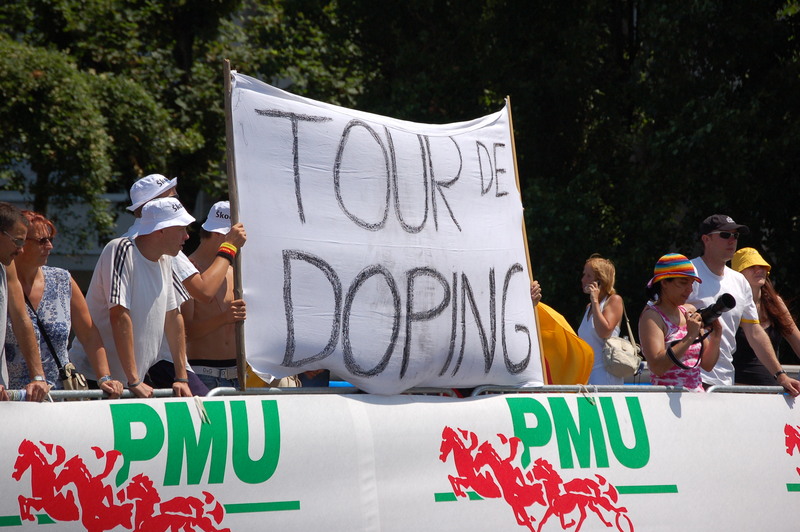 Plus one rider busted for cocaine and one for EPO. Now bikes are being randomly checked for hidden motors inside the frames. That’s right, mechanical doping is said to be the latest weapon in the cycling cheat’s armoury. And while no one’s been caught yet, it’s pretty hard to come up with an explanation for something like this. To top it off, the biggest dope of all, Lance Armstrong, is back at the scene of the crime, riding two stages of the course a day ahead of the peloton to raise money for charity. He’s there just as questions are also being asked about race leader Chris Froome, whose performance has been a little too dominant for some. “I know what that is like for a guy like Chris… to deal with the constant questions,” says Lance. Except you were actually guilty, remember? And with that, he was off, to the rapturous applause of approximately zero fans. In southern France, farmers are threatening to blockade Le Tour next week because wolves are eating their sheep. What the peloton can do about that, apart from tranquillising said wolves with whatever’s in their stash, is anyone’s guess. For all the riders, there’s the standard obstacle course of crazed, partially clad fans to navigate. Then there’s these guys, who are positively bovine. Snare drum, please. Over at Wimbledon, Formula One champ Lewis Hamilton was barred from watching the men’s final in the Royal box because he wasn’t wearing a jacket and tie. Or maybe they didn’t like his floral shirt. And with no Voldemorts left to kill off, JK Rowling disarmed a Twitter troll who likened Serena Williams to a bloke. Celebrating their tournament wins, Serena and Novak Djokovic took to the dance floor to the tune of the Bee Gees’ Night Fever and did a very good impression of two kids at a Blue Light Disco. Bless. On the other side of the world, Tennis Australia has taken on a new gig as oracle after inadvertently listing Bernard Tomic as playing in a ‘Hall of Shame’ tournament. A drunken Bernie just spent a day sobering up in the slammer after being evicted from his luxury Miami hotel in the early hours of the morning for refusing to turn down the music. So Hall of Shame was not so far off the mark after all. 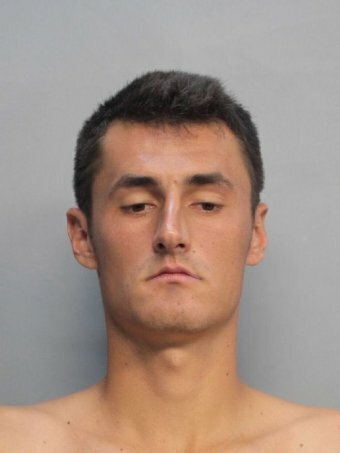 Bernie even went shirtless for his mug shot. Also scoring an own goal was this goalie. Mixed martial arts star Ronda Rousey didn’t let the opportunity slip after winning ESPY’s Best Fighter award against a field that included serial domestic abuser Floyd Mayweather. “I wonder how Floyd feels being beat by a woman for once,” she said. In the first Ashes Test, England captain Alastair Cook was taken down by a rogue ball to the nads and his vice-captain Joe Root was all sympathy. And with Shane Watson finally dropped for the second Test, thanks to the reader who alerted me to this video from the archives of Watto in yet another leg before wicket incident, while he was fielding! …Mechanical doping! Okay, I’m floored. I know! Where will they stop?